The intimate link between landscape and urban planning has long been denied and underestimated. In spite of the “good intentions” of certain scholars, practitioners and policy makers across Italy, Spain and other EU countries, their efforts are undermined by rigidly framed, sector-focused laws and by a concept of landscape defined in purely aesthetic terms. We have established the importance of identifying tools used to integrate the various approaches that “urbanism” and landscape planning adopt in dealing with urban planning to date. In fact, even with the prospect of significant environmental legislation, the discipline is still unable to incorporate the concept of landscape and its associated values. 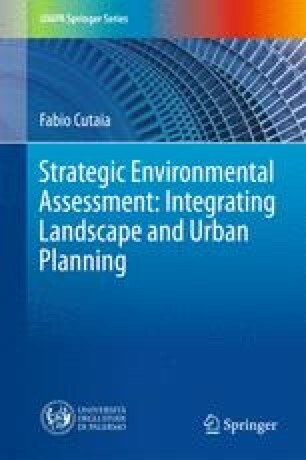 The work presented, throughout the course of the treatise, shows that a real opportunity for Strategic Environmental Assessment can be fully exploited if properly devised, becoming the “cross-linkage” to facilitate plan integration of environmental, economic and social sustainability. However, the matter triggers new questions, above all regarding the participation of people to promote and realise plan policies, identifying landscape values belonging to their territory. These questions remain open, as we need to indicate and specify a real approach that can be referenced.